Expansion has been the aim over the past decade as the next generation enters the Heywoods’ dairy farming business near Launceston in Cornwall. But when low milk prices started biting, the family took radical steps to improve efficiency on one of its farms to secure future viability. From having a total of 450 cows 10 years ago, Geoff Heywood along with father Les and sister Clare now run three units between them, totalling around 1,000 cows by the end of last year, all on cheese contracts supplying Dairy Crest’s Davidstow plant. Trenault Farm is run by Geoff on an intensive grass-based system using largely crossbred cows, a departure from the family’s general approach of working with higher yielding Holsteins. Geoff says that with the 114 hectare grazing platform surrounding the farm, not to mention the relatively light land and extended grazing season offered by the temperate Cornish climate, it’s been a great opportunity to apply some of the learnings he acquired from working in New Zealand. Until a year ago, we were running 380 cows on an equally split spring and autumn block calving at Trenault,” explains Geoff. “We averaged 7,400 litres/cow but were switching targets to a ‘per hectare’ basis, chiefly 10,000 litres milk from forage – 800 to 1,000kg combined fat and protein – from the 14 tonnes of dry matter/ha grown on the grazing block and silage ground that support the dairy. But then milk prices started falling, and Geoff and his nutritionist Luppo Diepenbroek began wondering if their strategy was the right one – or whether they could adapt the system to increase its resilience. The main change has been to reduce milk production per cow back to 7,500 litres for the autumn calving herd, and 6,200 for the spring calvers. To maintain total output, cow numbers in the spring calving part of the herd rose to 450 this spring. Increasing stocking rate on the grazing platform to 3.85 cows/ha allowed full utilisation of the grass grown for grazing, leaving silage for the ground further away. “Grass grown on the milking platform is our most profitable feed,” explains Geoff. There were sufficient cubicles – just – to accommodate the extra cows over the winter, but Geoff took out a feed trough to free up space for more, giving the cows better choice with the aim of maximising lying time. This also formed part of a bigger switch away from diet feeding to easy-feed silage as part of Luppo’s changes to the feeding regime. Luppo worked with Geoff to fine tune the new feeding programme, built around maintaining a stable rumen function in cows while extending the grazing and introducing self-feed silage. Firstly, the grazing period was lengthened – by six weeks in either direction. So last autumn the cows came in mid-November and turnout was 5 February. And last season the team clamped grass along with straight feeds at 10% inclusion rate per tonne fresh weight of silage, to a height of 2.5m; removing the top layer of around 0.5m at feed out and putting it in a bunker increased choice and ensured a feeding height of no more than 2m over the winter. This year, they clamped to just over 3m to cater for the extra cows, planning to remove the top metre for feeding separately. Luppo explains: “Including the straights in the silage has two functions: loosening the silage pack so it’s easier to eat and reduces potential damage to cows’ teeth; and raising the feed value nearer to that of fresh grass, so the diet is more consistent between housing and grazing, or if the cows are kept in on a very wet day. 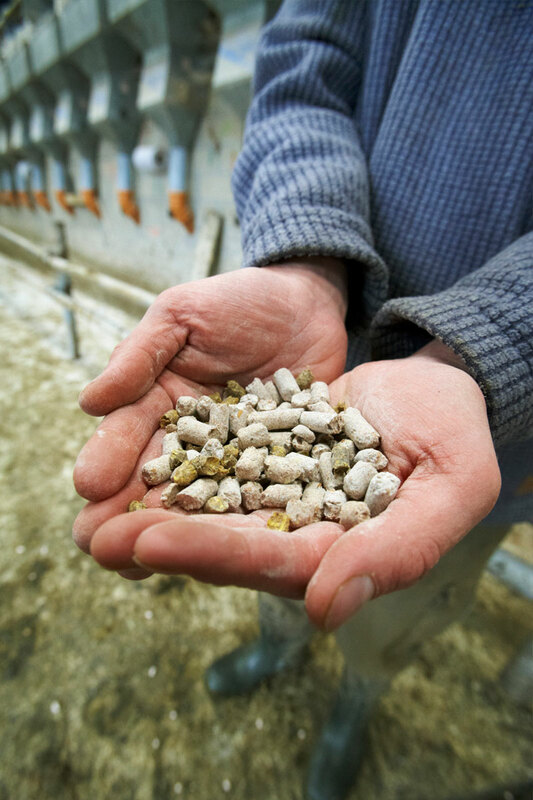 While the cows were previously buffer-fed TMR, now they eat grazed grass for nine months of the year with a top up of cake, wheat-derived products and nutritionally improved straw pellets (NIS) in the parlour to give an overall crude protein of 17% across the diet, says Luppo. 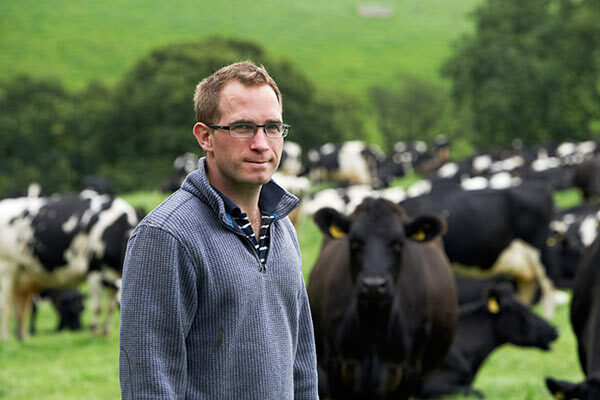 “I got Geoff to start using NIS two years ago and again last year to correct the depressed butterfat caused by low fibre in the grass at peak growth or grazing periods. This year we added it preventatively for two months, throughout April and May, then progressively knocked back the ratio of 1kg NIS to 2kg concentrate as the season progressed and grasses started heading. “Like many farmers, Geoff’s restricted on how much milk he can sell. So taking this approach lets him increase solids – and income – without increasing volume, as well as optimising nutrition from the grass by keeping the rumen stable,” adds Luppo. This year, straights were clamped in with the grass silage again, giving the threefold advantage of buying at a cheaper time of year, eliminating storage requirements and making feeding easier, leaving just a small top up of cake mixed with straights fed in the parlour over the winter. So overall, how have these changes impacted performance? Luppo says in the grazing season Geoff’s getting three-quarters of his milk from forage from grazed grass at a stocking rate of three cows/hectare. “This could be better; our target is 1,000kg milk solids/ha from the forage grown on farm, and realistically we are still falling short at around 760kg. Increasing solids production will help reduce our costs further. He says overhead costs of feeding have also reduced – removing the costs of maintaining and operating the feeder wagon, buffer feeding, and other daily feeding tasks has saved, on average, two hours every day costed at £35/hour including depreciation and labour, which totals £25,000. With lower value straights bought at a cheaper time of year, total costs have been reduced by 3ppl, taking cost of production down to 20ppl on a comparable farm profit basis. If you have a question about any of our products please contact us on +44 (0)1480 860 745 and a member of our team will be more than happy to help.